What a surprise to encounter one of my ancient novels at the local second hand store. 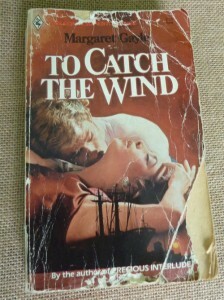 To Catch the Wind, a Harlequin Superromance, was published decades ago when I wrote for the publishing giant. These fat romances are supposed to have a shelf life of about a month before they are replaced by the next month’s offering. Yet here is the book, its cover creased and ripped, its pages dog-eared and worn, its spine cracked in three places, still going an age after publication. No bad for a genre book, one among myriads. It carries one of my pen names from back when I was trying to remain mysterious – a laughable idea for marketing frenzied authors today. I wonder now about all the people who read not just this particular copy but all the copies distributed worldwide. Harlequin had 200 million readers at the time and, no doubt, many more now. The book took months to write and a ton of fascinating research into boats and high-end retailing, knowledge that still hangs on in patches. I hope the spine was broken by someone on a sunny beach, gripping the book against a rogue tropic breeze. The pages have been dog-eared by much turning, the cover rumpled and torn by travel in handbags, the edges frayed by being pulled in and out of pockets. Most of all, I am pleased at the enjoyment that has flowed from its pages. Enjoyment is the only thing that could have kept keep this book alive. Perhaps this old friend dropped in to give me a high five and encouragement. Thanks. So good to catch up. Now I’ll return the book to the second hand store to continue on its journey. Good luck to it through its next many years. Next Next post: Winter Robins – Directionally Challenged or Suicidal Mavericks?